In case you hadn’t noticed, the 2012 games have arrived! Following an impressive opening ceremony on Friday evening, the first medals were being dished out by 10am the very next morning! Thousands of athletes from 204 countries around d the world have converged in the East of London with one goal in mind, to put month of dedication, focus and training into one moment of perfection and achieve the ultimate award, the coveted podium moment and the gold medal! As the energetic and athletic top percenters of the world give it their all, we’re going to take a look at the true value of their reward, just how much is a gold medal actually worth? 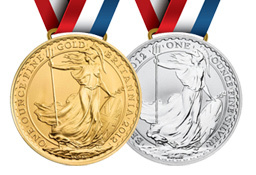 Each of the 4,700 gold, silver and bronze medals has been expertly crafted by the Royal Mint in South Wales. Each gold medal measures 85mm in diameter with a thickness of 8mm and an overall weight of 412 grams. The 2012 medals are the largest and heaviest of any produced to date. Leaving the sentimental and sporting memorabilia values aside, the value of each gold medal boils down to two precious metals, silver and gold… Regulations specify that each medal must contain a minimum of 6 gram of fine gold, considering the overall weight of 412 grams, that makes just 1.46% actual gold! 92.5% is fine silver and the remaining 6.04% copper. To calculate the true metal values on the evening of the opening ceremony, we’ll use the PM London fix of £1,026.87 troy ounce for gold and £17.71 per troy ounce (31.1034768 gram) for silver. As a cast of thousands presented London and all that is British to the world, on the open market, based purely on the fine metal value, each gold medal was worth £415.79! Will Mr Bolt be searching for Scrap Gold dealers come the closing ceremony? We doubt it, besides… he’ll have to win one first!